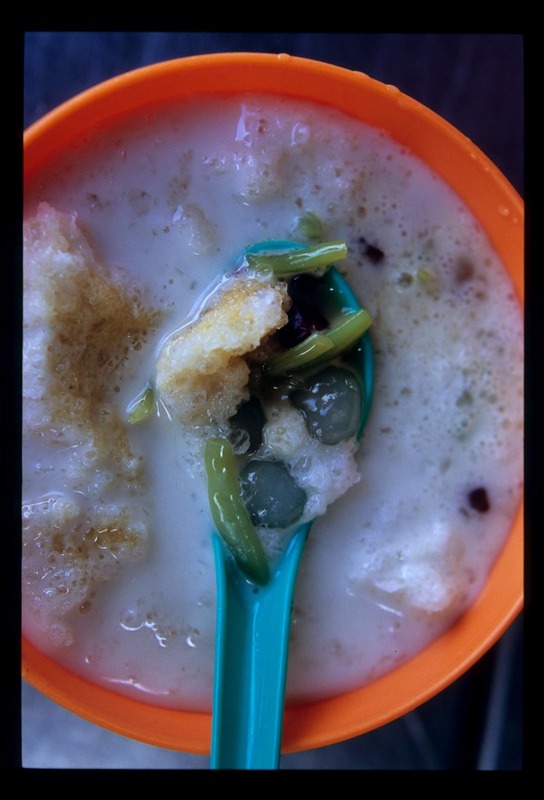 EatingAsia: The Making of a Cendol Snob: It's About the Gula, Stupid! The Making of a Cendol Snob: It's About the Gula, Stupid! Before last weekend I could count on one hand the number of times I'd eaten cendol. Here we are, coming up on two years in Malaysia, and I'd partaken of the beloved Malaysian shaved ice treat exactly twice. Yes - I'd downed cendol, and I suppose I'd enjoyed it, but I just didn't get it, so it floated to the outer orbit of my must-eat Malaysian food universe and just stayed there. And then there was gula. You see, over the last year or so I've become an unbearable palm sugar snoot. As Dave and I traipsed around Malaysia and Sumatra researching palm sugar for a presentation we gave in April I honed my sugar tasting skills. I watched, listened, and learned from small-batch producers. I collected - and sampled - many kilos of gula (gula=sugar). I'm able to distinguish between mass-produced and artisan sugars and I can taste the difference between gula made from the sap drawn from at least four palm varieties. Utterly useless skills - except when it comes to determining the difference between a good cendol and a great one. Cendol is simple, just five ingredients in its most stripped-down form: shaved ice mounded over chewy pandan-flavored 'pasta', santan (coconut milk), a splash of condensed milk, and gula Melaka (coconut palm sugar named for the southern Malaysian city of Melaka, but produced all over Malaysia) syrup. Add-ins like sago pearls and red beans are optional. Any dish this uncomplicated requires top-notch ingredients. There's not much variation in ice and condensed milk (some cendol fans will argue the latter point), but the pasta better be smooth, sturdy, and fragrant with pandan leaf, the coconut milk fresh, creamy, and undiluted with water, and the gula sourced from a producer who knows his or her way around a coconut palm patch. Malaysian and Indonesian palm sugar is unlike any other sweetener - rich and complex, with a whole host of notes that go well beyond the realm of 'sweet'. Brown, dark brown, and muscovado sugars can't touch it. Nor can Thai or any of the other 'upper' Southeast Asian palm sugars. It must be tasted to be believed (unfortunately the good stuff isn't exported). 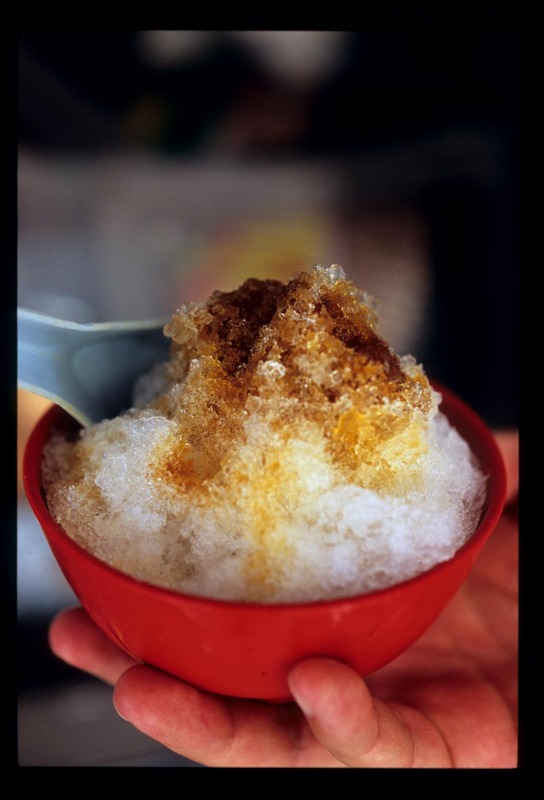 It's the perfect partner for coconut in any form - and cendol's shaved ice provides the ideal backdrop for a palm sugar-coconut pairing. 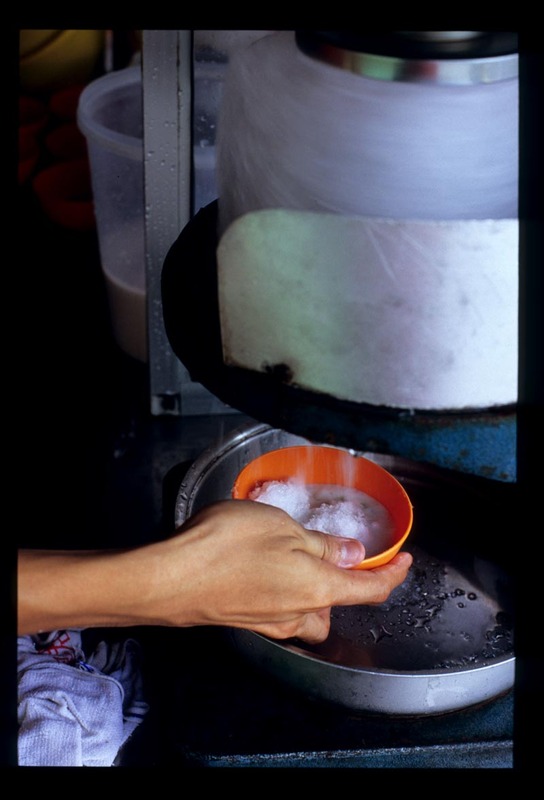 Many of Melaka's cendol vendors sell bags of gula. I take this to indicate a certain amount of pride in one's ingredients. Some purchase their gula from small shops or distributors, but others go right to the source, buying directly from a small producer somewhere in the vicinity. My tastiest cendol in Melaka was had by chance, at Makko Nyonya restaurant. Dave and I had stopped by to chat with Maureen, the owner, about her 23-year-old establishment and the food she serves there. Dining wasn't on the agenda for this visit (we'd just had our second breakfast) but Maureen greeted us with bowls of exquisite cendol. Everything about it was right: the coconut milk was so rich that melting ice barely made a dent; the red beans were large and cooked through but not mushy; and the noodles were toothsome and identifiably pandan-flavored. The smoky, butterscotchy gula syrup sent me into a swoon. We purchased a bag of sugar on the way out. I've been nipping from it all week, shaving off bits of gula and eating them like candy. Friends recommended the cendol at Donald and Lily's Nyonya Food (cendol is dish up from a stall on the street, dishes are served in the small room upstairs) in Melaka old town. A very good cendol indeed but, compared with Maureen's, just not stellar. Beyond too-small, mushy beans that don't maintain their integrity when mixed with the ice, this cendol simply lacks the gula 'wow' factor of Makko's version. If I wasn't such a gula snob I'd probably be raving over it. But with gula, as with so many other things in life, once you've tried the best it's hard to settle for less. In a few hours I'll be flying to Penang to meet Dave. He plans to introduce me to what he claims is the best cendol in Malaysia. Now, wait just a minute, Dave - I'll be the judge of that! Makko Nyonya, 123 Taman Melaka Raya (off Jalan Parameswara), Melaka. Tel. 06-2840737. 1130a-245p and 6-930p. Closed Tuesdays. Donald and Lily's Nonya Food, facing the parking lot behind Hereen Guest House, Melaka old town. 930a-4p. Closed Mondays. i never liked red beans, but they had huge ones in the bowl and i ate all of them because the cendol was so good! I love cendol and miss it terribly now that I am not in Msia anymore. I have tried to make the green pasta noodles using mung bean flour & lye water but they turned out so so. Do u have any suggestions? Thx! q- I never really liked red beans either, until last wknd! Chris - never tried making them myself. Perhaps I can convince a cendol master to reveal his or her secrets. ...(unfortunately the good stuff isn't exported). -Indonesian "gula jawa" or "gula merah" can be found in ethnic grocery shops in San Francisco, California. I'm pretty sure one can find the palm sugar in other major cities with big s.e.asian population as well. Anon - yes, there are a couple brands available in the U.S., Wira is one of them. But the flavor of these really can't compare to that of the sugars made by single, small producers. It's not as complex, not as subtle and, to me, has a wee bit of chemical taste to it. It's like the difference between Bertolli olive oil and that of some specialist producers (or any other mass versus artisan-produced food). The Wira is fine for curry pastes, but I'd never use it in something like cendol, where the unadulterated flavor of the gula is such a strong component. Unfortunately the small-batch palm sugars are not exported, not yet anyway (a gourmet foods importer needs to discover them, I suppose). Incidentally, Indonesian palm sugar (gula jawa = java palm sugar and gula merah = 'red' sugar which simply distinguishes it from white) is a bit different to Malaysian gula Melaka, and may or may not come from the same variety of palm (coconut). Tans - well, for *me* it's all in the gula. Others have their own cendol fetishes, I suppose. :-) I know the place across from the church in Melaka. It's the most popular bec. of it's position, and certainly all the tourists go there. A local's opinion: 'Pretty good, but there are much better cendols in Melaka.' We didn't try it this time. Maybe next trip. I don't discount any place simply bec. it's loved by tourists - we are them, after all! hi there! i'm a 19-year old studying in melbourne, but born and bred in malacca. i'm really glad i came across your blog, it reminds me so much of home. and yes, being malaccan, i'm super-proud that we have the best f**king cendol in the world! by the way, if you haven't already, you need to try malaccan "chinese satay", otherwise known as "jonker street satay". Hi there, I'm a regular visitor to your site and I really enjoyed your experiences with indigenous foods from different places you visited. I grew up eating lots of traditional cakes served with gula jawa, and so far the best gula jawa I tasted is from Manado, North Sulawesi. I hope you can get hold on the gula from this region and give the verdict. Thanks. Hi Mei - do you mean satay celup? Tried it, the one at Capitol Cafe. Yum! Christina - thanks for the tip. We've been wanting to get to Sulawesi for a long time, and hopefully will do so this year. 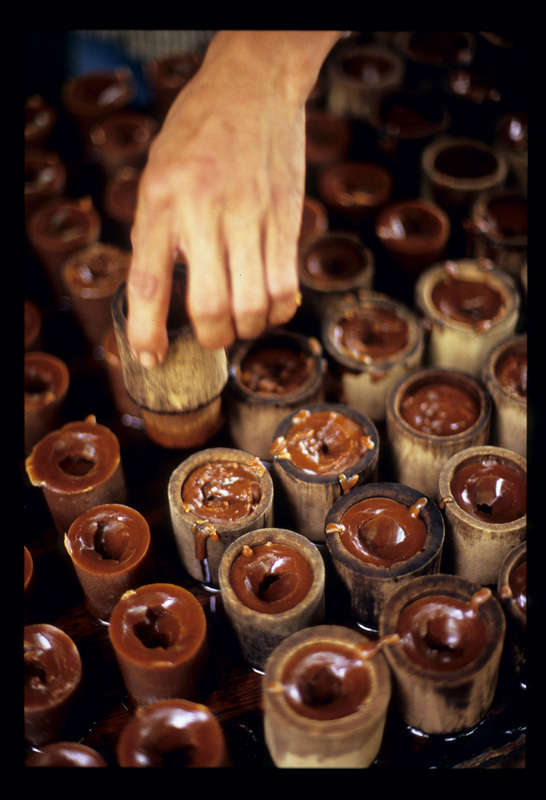 We will definately keep an eye out for palm sugar in the markets. Have you tried "gula anau" from the "anau" palm? Its the gula version favoured by negeri sembilanese. Jem - yes, we picked some up in Kuala Pilah. It's wonderful, so complex! Many Malaysians aren't aware of its existence and, as far as I know, it's produced only in Negeri Sembilan. Is that true, to your knowledge? hi. nope, not "satay celup" (although, that's pretty damn good as well). i'm actually talking about the "chinese" version of satay, assuming the normal kind you find is "malay" satay (sweetish, turmeric marinated chicken). 2 big differences; firstly, "chinese" satay is "non-halal" so you get chicken as well as pork, pig intestines (so good), etc. secondly, unlike "malay" satay, it doesn't have any sugar, so it tastes more savoury. i'm guessing they use slightly different spices to marinade the meat as well. it's also called "jonker street satay" as the most popular shop used to be in jonker street, but has now moved to an unknown location, and now there are probably only 2 or 3 places in malacca that you can actually find this type of satay. i'm not sure if the name is right, but try "ming's satay hut", which is on jalan pm 4 (i think), very close to the "sri costa" hotel. Glad that you guys were eating good in Penang. You have to do round 2 soon! Haven't seen the gula in the other states so far. Could not be sure too whether the homeland where the negeri sembilanese came from (Minangkabau) have the same version. I certainly liked it better then the gula melaka version. I find the ones in Melaka are more authentic "barebone" cendol i.e. shaved ice, santan, gula melaka & cendol - that's it, ala Nyonya style. Therefore, the coconut milk and gula has to be spot on to get the perfect concoction, otherwise any falterings in those area will show right up. The Penang style can still get away with it since there's a mish-mash of stuff in that bowl, so any deficiencies in the gula melaka and santan is less obvious. Yes, cendols...everyone has their favourite spot. I think I've tried all the cendols in the places mentioned above. The famous penang one is definitely good. Those people seemed to have gotten the ratios down to a pat. But like Penang Island itself, the cendol was made at too fast a pace for my liking. I prefer the Malaccan cendol with all the shaved ice still unmelted and with the gula melaka dribbled on top waiting for the patron to mix it in themselves. It's hard to make a good one but when everything is just perfect it is just the best thing on earth! mei, Rasa, Fatman - I have to agree with Justin about famous Penang cendol. Assembly is a problem here (for me, anyway). By the time the bowl hit my mits the ice was almost entirely melted. This may or may not account for the fact that the santan seemed not as rich, and the gula not as delicious, as our favorite Melaka version. So, for me Melaka cendol still rules (post upcoming). The mish-mash is, I think, ais kacang not cendol. I don't care for this -- too much going on and I don't like the flavor of the syrups. Though I do like the sago pearls and the chewy sweet palm seeds. the tjendol my grandma and aunts made was with santen/coconut milk, the green thingies and gula jawa or gula aren. we got lots of tokos here in the Netherlands, they import stuff from Indonesia, China etc. the gula i use now is from jakarta p.t. wika aksara. i used to try and taste all brands, but didn't really keep track of names etc. there's also these small pancakes with a sauce of gula jawa, only my grandmother made them, she is from Cheribon/Cirebon, Indonesia. I'll keep track of this site now and should you ever travel to Cirebon, let me know, ok? 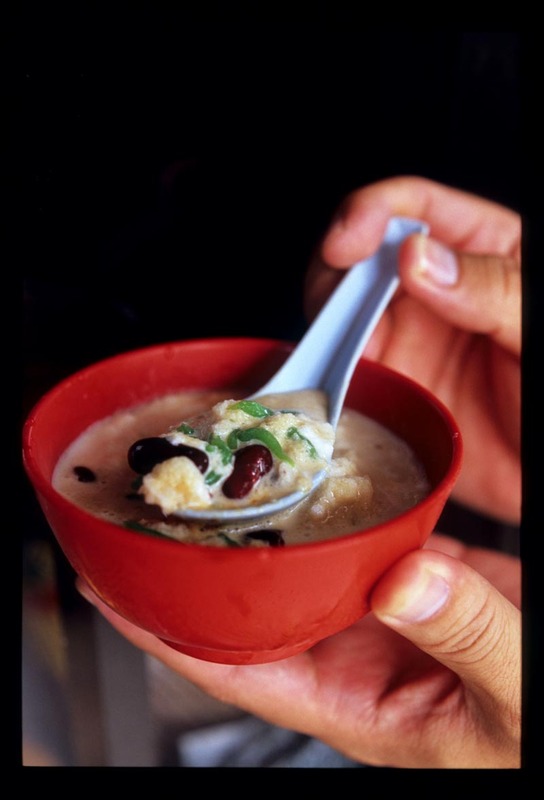 Gina - thanks for sharing your memories of cendol and gula! I will definately contact you when (not if) we get to Cirebon. Robyn,you are a girl after my own heart! I am having serious Makko Cendol withdrawal. Had some last December after 15 years and the taste is pure heaven. Sweet with slightly bitter undertones all balanced with the saltish santan, all in a cool icy mouthful. Yum! I want to go back to Makko! for the Cendol and the ikan goreng cili. 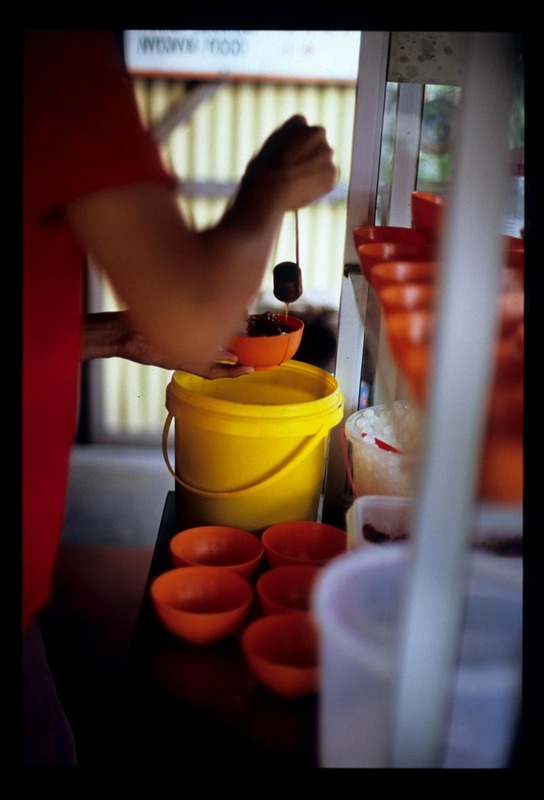 There is a babanyonya cendol shop at Bukit Rambai Melaka, which many claims is the best. Have anyone heard of it? Just want to know since i am from this area. Hi Pete - you are getting around, that's for sure. I can't agree ... IMO the Penang Road Teochew cendol pales in comparison to Makko's. I place much (all) emphasis on the gula Melaka and to my taste buds Makko's is richer and darker. But, as with many things ... to each his own. Hope you managed some Teochew seafood while you were in Melaka.